2. TRIP: The act of transportation on one the Carrier's lines on a particular day and at a particular time from one point to another. 3. INTERCITY ROUTES: Intercity fast ferry and sea bus lines. 4. CITY ROUTES: Sea bus lines within Istanbul. 5. CONVENTIONAL FERRY ROUTES: The open deck, conventional ferry lines carrying vehicles and passengers. 6. TRANSACTION FEE: The fee added to the ticket price for the sales service of any intercity line. The added fee may vary depending on the sales channel. 7. INVOICE: Tickets for intercity lines are valid as an invoice. 8. FARES: The fee paid for the right to travel on an intercity line, a city line or a conventional ferry line. 9. TICKET: The transport document issued by or on behalf of the Carrier marked with the heading "passenger and vehicle ticket", which lists the Transport Terms and Conditions and warnings. 10. DAYS: Refers to the seven calendar days of the week including bank holidays, with the proviso that in terms of notification, the day on which a notification is received or in terms of determining its period of effectiveness, the issue date of the Ticket or the day of commencement of transportation is not taken into consideration. 11. BAGGAGE: The objects, materials and other personal belongings necessary for the passenger's short term needs of for their holiday. In no case may baggage exceed 20 kg in Economy Class and 30 kg in Business Class. 12. REGISTERED BAGGAGE: The baggage accepted for carriage by the Carrier upon the issue of a baggage coupon. 13. UNREGISTERED BAGGAGE: Any other baggage carried by the passenger that is not registered baggage. 14. CARRIER'S TERMS AND CONDITIONS: The terms and conditions published or produced by the Carrier which regulates the carriage of Passengers and/or baggage and which is valid on the date of issue of the ticket and includes the fare in force at the time. 15. AGENCIES: The İDO ticket sales agency authorised by the Carrier to represent it in the sale of passenger transportation services by sea. 17. PASSENGER: The persons, with the exception of the operation and management personnel of sea buses and ferries, who are or are to be transported, subject to the consent of the carrier, via sea buses, fast ferries and conventional ferries. 18. CARRIED VEHICLE: The vehicles which use the sea transportation service provided by İDO’s ships which are adapted for the purpose of carrying vehicles. 19. DAMAGE: Includes death, injury, delay, loss, damage, partial damage or other harm arising in connection with the carriage service during the course of carriage by the Carrier or in connection with other services related to the carriage. 20. FLUID PRICING: İDO is not bound to applying a fixed fare, and the fee schedule varies depending on the proximity of departure, on a particular day or at particular times and on the number of vacancies on the ship. The Carriage Regulations specified here apply to the carriage of all passengers and vehicles transported by sea by the Carrier for a fare. Unless any other regulations are introduced by the Carrier concerning carriage regulations, agreements, tickets and other free passes, the General Conditions herein also apply to any carriage based on discounts or free travel. In the event that any condition referred to herein or contained in these Carrier's Rules is contrary to applicable laws, government rulings, orders or requests that cannot be renounced by the parties, any conditions herein that are contrary to the law cannot be applied. The invalidity of any ONE condition does not affect the validity of the other conditions. Until proved otherwise the Passenger Ticket serves as prima facie evidence of a carriage agreement between the carrier and the passenger in possession of the ticket. The contract conditions listed on the ticket are a summary of some of the Carriage Conditions herein. A passenger who fails to present a valid ticket as issued by the carrier according to the Carriage Conditions is not entitled to claim any rights. The Passenger is not entitled to carriage in the event that the presented ticket is ripped or torn, or has been modified by anyone other than the Carrier or its authorised agent. In the event of loss of the ticket İDO AŞ cannot issue a replacement. The passenger may only travel upon purchase of a new ticket for the relevant trip. A passenger ticket issued in a person's name may not be transferred or resold. If a ticket is presented for carriage or refund by anyone other than the person entitled by that ticket to travel, as long as the carrier carries or refunds the person who has presented that ticket in good faith, it is not liable to the person entitled to travel with that ticket. Tickets for İDO city sea buses and fast ferries are sold through different sales channels. In the event that a ticket offered at a reduced price is acquired at a higher price through a different channel as a consequence of temporary problems, the difference between the reduced price and the sales price cannot be claimed. Visit www.ido.com.tr or call Customer Services on +90 850 222 44 36 for more information. Because a dynamic pricing system is in effect for intercity lines there are no fixed fares. Sale of tickets for intercity trips that take place during the course of a year will begin on dates specified by the carrier. On Intercity Lines, the carrier specifies whether the seats are numbered or unnumbered on specific lines or trips. The carrier reserves the right to change a trip with numbered seats into a trip with unnumbered seats. The carrier shall specify which persons are eligible to purchase reduced price tickets. Passengers in possession of reduced price tickets must show their discount pass at the Terminal or when requested to do so by the ferry staff during the course of the journey. Failure to do so will result in the passenger being charged twice the amount of the difference between the full price and the reduced price. Passengers on Intercity Lines, City Lines and Conventional Ferries who are discovered to be travelling without a ticket will be charged twice the ticket price. Following the purchase of a ticket for an İDO intercity trip, in the event that trip is cancelled for reasons beyond the control of İDO (such as adverse sea or weather conditions, etc. ) the ticket price will be refunded to the passenger in full; in the event that a ticket is subsequently purchased for an alternative date, any potential price difference between the fare for the cancelled trip and that of the newly purchased ticket cannot be claimed. Please click here for the ticket cancellation / conditions for refunds and changes. The passenger shall proceed to the area identified by the Carrier for the boarding procedure in a manner which is compatible with the carrier's departure and boarding procedures, and shall not arrive at the boarding gate any later than the time specified by the carrier. Failure on the part of the passenger to be at the departure terminal at the time specified by the Carrier (30 minutes prior to the time of departure) will result in the loss of the right to travel if crowded conditions or other circumstances at the terminal prevent the passenger from travelling; the loss of this right may not be contested. Any ticket purchased is only valid for the trip specified on it and does not constitute a right to travel on any other trip; expired tickets are invalid. It is the passenger's responsibility to check that the details on the ticket are correct; any objections presented subsequently are invalid. It is dangerous and prohibited for passengers to board or disembark car ferries, sea buses and ferries before the landing ramp has been fully lowered and the ferry staff have given the go-ahead for boarding or disembarking and before the necessary safety precautions have been taken. • If the Ticket presented by the passenger has been acquired illegally, or if it has been issued or purchased by someone other than the Carrier or its authorised agent, or if it is reported as being stolen or lost, or if it is a forged ticket, or if someone other than the Carrier or its authorised agent has modified it or if it is ripped (in which case the Carrier reserves the right to confiscate such a Ticket) or if the person presenting the Ticket is unable to demonstrate that s/he is the person named in the section "Passenger Name" (in which case the Carrier reserves the right to confiscate such a Ticket). • The purchase of a ticket notwithstanding, the Carrier may, for safety reasons, refuse to carry vehicles that pose a danger owing to dangerous cargo, or because their height is liable to affect the balance of the ship, or if they present a danger in parking, docking or manoeuvring due to their dimension, weight, or other causes. The First Mate is authorised to determine these matters. In such an event the ticket price will be refunded in full. • Vehicles that run on flammable, explosive gases, such as LPG or CNG, are not accepted on ferries with enclosed vehicle decks. The passenger is responsible for stating whether the vehicle runs on LPG at the time the ticket is purchased. In the event that the passenger fails to state this information, the carrier cannot be held liable for the resulting pecuniary and non-pecuniary damages. • The carrier reserves the right to refuse carriage to passengers who arrive at the boarding terminal in an inebriated state or while under the influence of drugs to the extent that they adversely affect the safety or comfort of other passengers or disrupt the journey. In such an event the ticket price will be refunded in full. • The Carrier shall not pay compensation to Passengers who have been refused carriage. Admission for carriage of unaccompanied children, passengers requiring special assistance, pregnant women or sick people may be subject to prior agreement and arrangement with the carrier, as per the Carriage Terms and Conditions. During the carriage of such passengers, the carrier may not in any way be held liable for any deterioration in the health of the passengers in question. Children under the age of 16 (sixteen) may not travel unless accompanied by an adult. In the event that they do travel unaccompanied, İDO cannot be held liable for any damages or harm that may be incurred. Passengers are entitled to take on board one suitcase not exceeding 20kg plus one item of hand luggage for Economy Class and 30 kg for Business Class.The carrier reserves the right to request payment for any baggage exceeding these 2 (two) items indicated. Except in cases where they are damaged through the fault of the carrier, the carrier is not responsible for hand luggage. Wheelchairs of physically disabled passengers are accepted on board free of charge in addition to the hand luggage stated above. Fragile or damageable materials or materials deemed unsuitable for carriage at the discretion of the Carrier on account of their weight or dimension, live animals not included in the regulations of article 6, firearms and ammunition may not be placed in baggage. The passenger may not place fragile or damageable materials, money, jewellery, precious metals, silver, deeds or other commercially valuable documents, passports or other identification documents or copies of the same in registered baggage. The carrier cannot be held liable for any damages arising from the placement of items listed in this clause inside the Baggage. • The Carrier may refuse to carry as baggage those items that have been identified as being prohibited and similar items and may also refuse carriage of items that are not detected initially but are detected when they are handled. • With the exception of those items listed in Clause 6.2, the Carrier may refuse to carry any article as baggage on account of its dimension, shape, weight or properties. • The Carrier may refuse to carry as registered or unregistered baggage any articles that have not been packed into bags or suitcases or other suitable containers with the necessary care to ensure their safe carriage. For safety and security reasons the carrier may request permission from the passenger to search his/her person, vehicle and baggage and may carry out, or have the search carried out, in the absence of the passenger. In the event that the passenger does not comply with this request, the Carrier may refuse to carry the passenger, his/her vehicle and/or baggage. The passenger shall pay a fee for the carriage of baggage exceeding the free baggage allowance stated in the baggage regulations. The Carrier may refuse to carry baggage exceeding the free baggage allowance and/or baggage for which an excess baggage fee has not been paid. * As of March 1, 2012, our guests are required to carry vaccination cards of their pets as they may be asked to show vaccination cards to officers at embarkation points when travelling as a walk-on passenger, at security checks while travelling by car, or whenever it is requested during the sailing. * Apart from travelling in owners’ vehicle on open deck of fast ferries and conventional ferries, pets with vaccination card, including cats, dogs and signing birds such as budgerigars, canaries etc. in special carrying cases, can travel in passenger lounges on all sea buses, conventional ferries, and fast ferries in the company of pet owners. * The dimensions of carrying cases in the lounge shall be maximum 23x40x55 cm. Pets inside carrying cases need to travel beside their owners (on the lap, on the floor next to the seat, etc.) in a suitable place and manner that will not disturb other guests or block the corridor passages. *If pets are not accepted inside the passenger lounge due to their carrying cases that are larger than 23x40x55 cm, they shall travel outside the passenger lounges in the places indicated by crew members on sea buses; in kennels that are available outside passenger lounges on ferryboats; and inside pet owners’ vehicle on fast ferries and conventional ferries with upper (open) deck. *Pets shall not be taken out of carrying cases during the sailing or pet owners’ vehicles while travelling on fast ferries and conventional ferries with open deck. In the event that pets are taken out of carrying cases or vehicles, crew members are entitled to warn pet owners, reminding that pets should be put back in cases or vehicles. *In accordance with Article 14 of the “Animal Protection Law” numbered 5199, it is banned to produce, own, bring into the country, sell or advertise, exchange, display or make a present of an animal which constitutes a danger such as a Pitbull Terrier, Japanese Tosa. As per the said Article, such species are not allowed to travel on board. Based on the regulations, the compliance of pets that are requested to be transported is controlled at terminals. *Dogs that cannot fit in carrying cases can be accepted to fast ferry trips provided that they use a muzzle; however, such dogs cannot be allowed to travel on inner-city and intercity sea buses (vessels carrying foot passengers only) by any means. *Dogs that will not fit in kennels are required to switch to fast ferries, provided that they use a muzzle, from outside the terminal (vehicle ticket booth - passenger exit). *If during related controls pets cause officers to suspect their health condition or possible disturbance of the healthy voyage, such pets may be rejected to travel on board. *IDO by no means accepts any responsibility for the deterioration of the health condition of the transported pets before, during or after the voyage. Travelling with pets shall be allowed if our guests take the full responsibility. The transporter shall not be liable for pets that die, become sick, be lost, or get injured during the voyage or any other costs and other damages that may arise from such occasions. The Carrier undertakes to comply with the carriage tariffs published at the date of travel and undertakes to exert its best endeavours to transport the passenger and his/her baggage within a reasonable time. However, it is possible that trips may be delayed or cancelled on account of circumstances beyond the Carrier's control. İDO cannot be held liable for any pecuniary or non-pecuniary damages arising from such an event. In the event that due to forces majeures the ship docks at a destination other than that specified, the carrier reserves the right to choose between procuring alternative means of transport and carrying the passengers to the destination specified on the ticket or refunding the price difference between the destination at which the passengers disembark and that specified on the ticket. The Carrier reserves the right to change the type of ship assigned to any city line, intercity line or conventional ferry line without prior notice. Forces majeures (technical difficulties, acts of nature, adverse weather and sea conditions) may result in delays and trip cancellations. İDO cannot be held liable for any pecuniary or non-pecuniary damages arising from such an event. The carrier is not subject to law number 4736. It is under no obligation to issue a free or reduced price ticket to any person or organisation. The Carrier is entitled to issue free or reduced price tickets according to its own regulation criteria. Free transport on public transport sea buses is offered to persons who have been disabled in the fight against terrorism, the widowed spouses of those killed, female minors registered under social security organisations other than T.C. Emekli Sandığı (which provides benefits for widows and orphans) who do not work and do not receive a monthly stipend from these organisations, boys who are disabled and dependent to the extent that they are unable to work, their children below the age of eighteen, and their parents. 1. In the event that a passenger behaves in a manner which endangers the ship or any individual or property or which impedes any member of the transportation staff from performing his/her duties or fails to comply with the requests of the transportation staff or gives rise to reasonable complaints from other passengers, the carrier may take the measures it deems appropriate to prevent the continuation of the misconduct in question, including restraining the passenger. 2. Passengers may not use any electronic devices on the ship without the consent of the carrier, only hearing aids required for health reasons and pacemakers may be used. Passengers must not leave their seats during departure and docking manoeuvres. Passengers must observe any warnings announced by the public address system or displayed on screen during the course of the journey. The carrier shall not be liable for any injuries or damages arising from failure to comply with these regulations. 4. Passengers are not permitted under any circumstances to smoke cigarettes or any other form of tobacco or to consume drugs on any intercity line, city line or conventional ferry line. If, during the execution of the carrier agreement the carrier makes arrangements for the provision of additional services, the carrier shall not be liable for such arrangements, except in the event of negligence. Passengers are required to observe all security measures and checks applied by the carrier. 1. The carrier shall only be liable for damages incurred to a passenger or baggage in the event that such damages are due to the fault of the carrier. In the event that the passenger is guilty of contributory negligence, the carrier's liability may be reduced or disregarded in accordance with legal provisions. 2. The Carrier is only liable for damages incurred during carriage it performs. It shall not be liable for carriage performed by another carrier. 3. As long as the carrier is not proven to be guilty of gross negligence, the carrier shall not be liable for damages incurred to unregistered baggage. In the event that a passenger is guilty of contributory negligence, the carrier's liability shall be subject to the provisions of the applicable legislation governing contributory negligence. 4. The carrier shall not be liable for any damages arising from its fulfilment of the provisions of any law or government decisions, requests or requirements, and similarly shall not be liable for any Damages arising from the passenger's failure to observe the same. 5. Carrier liability is limited to the actual proven amount of damages not exceeding the liability limit. The Carrier shall not be liable for any other damages that may occur indirectly. 6. The carrier is not liable for any injuries caused to the passenger on account of an object contained inside passenger baggage or for any damage caused to the passenger baggage. In the event that the property of any passenger causes damage to any person or to any person's property or to the carrier's property, that passenger shall be liable for indemnifying the carrier for all Damages and expenses incurred. 7. The Carrier shall not be liable for any damage caused to fragile or damageable materials, money, jewellery, precious metals, silver, deeds or other commercially valuable documents, passports or other identification documents or copies of the same carried inside the baggage. 8. If a passenger is in danger or at risk on account of age, mental or physical state, the carrier shall not be liable for any illness, injury or disability or resulting death of a passenger as a consequence of the above situation in the event that the health of said passenger deteriorates during carriage. 9. Laws restricting the carrier's liability or exempting it are equally applicable to the carrier's representatives, agencies, personnel, crew and the person steering the carrier's ship and his/her representatives, personnel and crew. The total sum of indemnification that can be claimed from the carrier and its representatives, personnel and crew cannot exceed the upper limit of the carrier's liability. 10. In the event of an accident resulting in passenger death, injury or bodily harm, the carrier's liability shall not be subject to any limitations prescribed by law. In the event that the carrier demonstrates that the death or injury was the cause of the damage or demonstrates the existence of concurrent negligence, the carrier shall be partly or wholly released from liability under applicable law. 11. In the event that the carrier waives their liability limit or their claim of non-liability, no social security or claims for indemnification from similar public organisations or institutions shall apply, regardless of the form in which they are alleged. The carrier shall provide indemnification for any indemnifiable damages of passengers deprived of their benefits that exceed the payments made by the social security or similar public organisations or institutions. Carriages carried out pursuant to the lease of boats using the service “ÖZEL ÖZEL SEFERLERİ” ("SPECIAL TRIPS") offered by İDO and which include the transportation of dangerous materials and the organisation of all types of events (weddings, meetings, excursions, private transportation, etc. ) are bound by regulations stipulated in a separate contract that will be drawn up for these activities. Customers should submit their complaints within 7 days of the incident that gave rise to their grievance, together with evidence, if it exists, (tickets, etc. ) to one of the following channels. The message will be dealt with within 15 days of receipt. Telephone: +90 850 222 44 36 (press 7). www.ido.com.tr: By completing a Contact Form. Request and Complaint Forms: Customers may submit their complaints by completing a request and complaint form which is available on Fast Ferries, Conventional Ferries (only on the Eskihisar – Topçular line) and at the terminals. In the event of damage to registered Baggage, if the person in charge of receiving the Baggage does not notify the Carrier of the damage immediately upon discovery, and within a maximum of 7 days after accepting the Baggage, or, in the event of delay, within twenty one days of the Baggage being delivered to him/her, s/he is not entitled to initiate proceedings on account of the damage. Complaints must be received in writing within the deadlines stipulated above. If a suit for damages is not filed within two years of the vessel reaching its destination or of the date on which it was scheduled to reach its destination or from the date on which carriage was interrupted, the statute of limitations goes into effect for any case or petition for loss or damages. No agency, member of staff or representative of the Carrier is authorised to change or make a disclaimer regarding the present Carriage Conditions. Your privacy is of utmost importance to us. İDO A.Ş. acts in the most meticulous manner to protect personal data that belongs to company’s clients. By visiting our webpage and/or using online services you agree to terms listed below: İDO A.Ş. can collect your shared personal information such as your name, last name, address, phone numbers, e-mail addresses, identity information, tickets and travel data. The collected data may be used to offer you better service, product and options, improve our website, manage processes that are related to your account, create report analysis confirmation and statistical data by establishing a database for trips, services, products, campaigns, promotions and share with specialists provided that privacy terms are followed, for İDO and partner companies to contact you via e-mail, sms and phone. İDO may share your personal information with companies that it procures services in compliance with terms stated above and/or with judicial and administrative authorities in case of a legal liability. İDO A.Ş. is entitled to change these carriage conditions partly or wholly as and when it deems necessary. The Law on Protection of Personal Data numbered 6698 has been enacted on 24th of March 2016 and published on Official Journey dated 7th of April 2016 numbered 29677.
. According to 32nd Article of Law on Protection of Personal Data numbered 6698, Articles 8,9,11,13,14,15,16,17 and 18 of this Law came into force six months after date of publication on 7th of October 2016. Law on Protection of Personal Data numbered 6698 has been regulated in order to regulate confidentiality of private life, protect fundamental rights and freedoms and liabilities of real and legal entities processing personal data as well as procedures and principles to be complied by them. Data Supervisor, as İstanbul Deniz Otobüsleri San. ve Tic A.Ş. (“İDO”), may use your personal data according to the relevant regulation in accordance with Law on Protection of Personal Data numbered 6698. 3. How will your personal data be processed? In accordance with Law on Protection of Personal Data numbered 6698, we, as İstanbul Deniz Otobüsleri San. ve Tic A.Ş. (“İDO”), in the capacity of data supervisor, can carry out all kinds of proceedings that can be carried out on data such as obtaining, storing, keeping, changing, rearranging, explaining, transferring, taking over, making available, classifying or preventing the use of your personal data that you shared with our company in a complete or partially automatic way or non-automatic means provided to be a part of any recording system. 4. How your Personal Data will be collected? Your personal data may be collected verbally, in written or on the electronic environment through our corporate website, mobile site, mobile application, our call center, our ticket sales counters, our contracted agents, employees of our sales and marketing department, forms collected during customer visits, digital marketing, agreements, applications, forms, through offers or e-mail, SMS or other means or during job applications, during signing employment agreement and/or information that you conveyed to us within working hours, and the cookies placed in your computer automatically when you visit our website. 5. What are the purposes and legal grounds for processing your Personal Date? You can check detailed information regarding the purposes of processing your personal data by İDO on this link . In line with aforementioned purposes and in accordance with Law on Protection of Personal Data numbered 6698 and relevant regulation, the person/organizations to which your personal data that you shared with us might be transferred are our, as İstanbul Deniz Otobüsleri San. ve Tic. A.Ş, direct/indirect local/foreign affiliated; our partners of us who fall within the scope of unincorporated associations, the organization that we cooperate with and that are partners of the program that we purchase services from in order to carry out our activities, local/foreign organizations and other third parties. 6. What are your rights as per Law on Protection of Personal Data numbered 6698? i. Request compensation for the damages in case the person incurs damages due to unlawful processing of personal data. 1. You may send your application to info@ido.com.tr using your e-mail address that is registered in our system and you have declared as per the membership/transportation agreement. Applicant should apply in person to the address of Kennedy Cad. Yenikapı Hızlı Feribot İskelesi 34480 Fatih / İstanbul with an official document indicating his/her identity. Note that the envelope should bear the written statement of “Information Request as per Personal Data Protection Law numbered 6698”. Applicant should send a notice to the address of Kennedy Cad. Yenikapı Hızlı Feribot İskelesi 34480 Fatih / İstanbul though Notary Public. Note that the envelope should bear the statement of “Information Request as per Personal Data Protection Law numbered 6698”. Applicants should simply send an electronically signed e-mail to ido@hs01.kep.tr with subject of “Information Request as per Personal Data Protection Law numbered 6698”. Your applications will be concluded as soon as possible and no later than thirty days, depending on the nature of your claim; however, in the event of a separate cost accrual, the Company reserves the right to charge a fee according to the tariff to be determined by the Company's Board of Personal Data Protection. Some rights to make demands were bestowed to personal data owners who are defined as related person (hereinafter shall be referred to as "Application Owner") at 6698 numbered Law of Protecting Personal Data ("PPD Law"), in related with processing of personal data in 11th article of Law. In accordant with PPD Law's 13th Article's first paragraph; applications which will be made to our company who is responsible from data in related with these rights shall be made as written or by other methods which are designated by Board of Protecting Personal Data ("Board"). In this context the applications that are made to our Company as "written", shall be delivered to us via hand by using hereby form, over notary or by registered electronic mail. In accordant with Law's 13th Article's 2nd paragraph your applications delivered to us shall be replied "as promply as proctible and in thirty days at the latest" starting from date of your application was reached us according the quality of demand. Our replies shall be delivered to you as written or from electronic environment as per provision of Law's 13th article. Information and documents that were requested from you shall be provided complete and correct according to qualification of your form and demand. In case information was not provided as it should be, there could be problems regarding handling researches which shall be done by our Company in line with your demand in a complete and qualified way. In this case our Company's legal rights are reserved. For this reason, related form shall be sent as it contains requested information and documents in accordant with quality of your request/demand. • Passengers must arrive in departure pier 30 minutes prior departure time. • On our Inner-City Sea Bus Lines, the vessels may depart from our terminals in case the capacity of the vessel gets full before the scheduled time of departure. • Ticket sales closes 5 minutes prior departure time. • Printed tickets MAY NOT BE CANCELLED by Call Center +90 444 44 36 nor our WEB site. They may only be cancelled at a TICKET SALES POINT. • Vehicles that run on LPG & CNG can NOT TRAVEL on the Yenikapı-Bandırma line. • Travelling inside the vehicle is not allowed in ferries with an enclosed garage. Please proceed to passenger saloon after parking your vehicle. • However they may travel on Yenikapı-Bursa, Yenikapı-Yalova and Pendik –Yalova fast ferry lines under conditions. Please click here for details. • Infants ( 0-66 month ) may travel free (the number of children travelling free is limited to the number of parents on the trip) as long as they do not occupy a seat. • Number of bicycles allowed on board is limited to 3 on inner city and inter-city seabus lines and are free of charge. • Number of bicycles allowed on board is limited to 10 on fast ferry lines and are free of charge. • Bicycle trasportation rules are subjet to change during summer timetable period. 1.All documents within internet site of İstanbul Deniz Otobüsleri San. ve Tic. A.Ş. ("İDO") are under ownership of İDO. None of the information in this site shall be changed, copied, multiplied, re-published, copied to an another computer, e-mailed, forwarded and distributed including codes and software. Printer printouts of internet site's pages could be taken for your personal use. 2. Notwithstanding that İDO took precautions for clearing of viruses and similar purposed softwares out of its internet site within available capability but in order to provide last security, user is liable to provide virus protection system and ensuring protection at his/her personal computer. In this context, user accepts that he/she is liable from all problems which may be occurred at his/her software and operating system also direct and indirect results of these problems as he/she visits the İDO's internet site. 3. All kinds of information that partakes within internet site of İDO are just porposed for introduction and information. User shall not assert the claim in any condition that he/she suffered loss since the 'information' on site are faulty or because of these 'information'. When user intends to make a transaction by taking information as reference, he/she accepts and undetakes that he/she is liable to obtain the final and trustable information from General Directorate of İDO İstanbul Deniz Otobüsleri San. ve Tic. A.Ş. and İDO İstanbul Deniz Otobüsleri San. ve Tic. A.Ş. has no responsibility because of outdated information published on internet site. 4. At it's own discretion, İDO reserves the right of changing the contents of site whenever desired, to change or end any service that given to users and to delete user information and data recorded within İDO internet site. Notwithstanding İDO took all kinds of precautions that its internet site is free of faults, İDO İstanbul Deniz Otobüsleri San. ve Tic. A.Ş. shall not be held responsible from existing or future faults within the internet site. 5. By nature of internet environment (WWW) information might roam within internet without sufficient security precautions and might be used by unauthorized people. İDO İstanbul Deniz Otobüsleri San. ve Tic. A.Ş. is not responsibe from the damages might occur because of these use and usage. 6. İDO reserves the rights of changing, renewing or termination its internet site's conditions of usage without notice. Each condition which is changed, renewed or revoked shall be binding for all users at the date of publishment. 9. Hereby agreement shall be conducted by not allowing any legal contradiction in accordant with Laws of Republic of Turkey. If any article of this agreement is illegal, invalid or inapplicable because of any condition then article in question might be removed from the agreement and remaining articles' validity and applicability in means of law won't be effected. How We Collect Data and Which Data is Collected? İDO A.Ş. might collect your personal data like your name, surname, address, phone numbers, e-mail addresses, identity information, ticket and your voyages. • Location information (limited with the permission regarding location information at your phone) You could stop this data flow any time you want by removing application from your phone (You could arrange data that are collected via your phone from application settings and permissions section of your phone). Cookies might be used when collecting data that are going to be processed in line with purposes which stated at our Privacy and Security Policy. Cookies are small text files that are recorded to your mobile device and your computer when you visit an internet site and holds various information regarding your visit. Today most of the internet browser have cookie blocking mode while visiting web sites. If you also activate the cookie blocking mode at your internet browser, you could not be able to benefit from some features that we developed for you in our web site. As like in most of the web site information like Internet Protocol (IP) addresses, browser tyoe and language, internet service provider (ISP), reference and exit pages, operating system, date/time stamp and clicking data are automatically collected and recorded. In some of our e-mail messages some click link URL's are used that connects to content on İDO's web site. When customers clicked one of these URL links, they pass from a different web browser before reaching target page on our web page. This link clicking data is tracked in order to designate interest on certain issues and to measure activity of communication with our customers. Camera recording system is used at our ticket offices for security of you,our customers and for operational purposes. In cases where legal action is need, related record might be shared with required official institutions. How We Use These Information That We Collect? These collected information are used to provide better service to you, our customers, to provide product and selection of offers, to arrange our web site; to arrange your transactions about your Sea&Miles account; to create and process report, analysis, verification and statistical information for cruises, services, products, campaigns, promotions by creating a database on condition that complying with privacy conditions. Also these information might be used via companies that we cooperate and to let you know about the promotions, campaigns, advertisements, marketing and other opportunities that are provided by partners by e-mail, SMS and phone. İDO might share your personal information with other companies which it takes services or companies that it cooperates on condition that the stated procedures for purposes stated above and providing conditions for ensuring privacy conditions and/or with judicial and administrative offices in case of legal oblication. Also your personal and/or demographic information might be used for analysis studies. By this way, products and services that are provided to you could continuously be improved, personalized and privatized. Uniting, updating or expanding your personal data that are collected via our web sites and/or applications, data obtained from outer sources or third parties are included to these. İDO might share cumulative customer statistics with third parties like business partners (including investors, press while not including personal data in individual level. If you don't want to partake within notification and information list, you could leave whenever you you want by updating your preferences. Access and control power over Commercial-electronic messages which sent by İDO for information and communication purposes are completely at your hand. If you wouldn't like us to communicate with you while your membership to our service and servicing continues, you could use your "CANCELLING" right at digital environment and you could perfom your cancellation transaction by sending a free SMS to 4933 by writing IDO RET or calling our call center. You won't be communicated until you send an approval which revokes this cancellation. If you would like to terminate benefiting from our services and choose leave membership you could call our customer services line. As a part of legal and social responsibility; İSTANBUL DENİZ OTOBÜSLERİ SAN. ve TİC. A.Ş. ("İDO") is obliged to act according to current legal regulations particularly Republic of Turkey Constitution ("Constitution") and 6698 numbered Law of Protecting Personal Data ("PPD Law") also İDO is conducting required studies regarding protection of personal data by making concordance to legal regulation in question, as a life cycle. Within the scope of these studies Policies of Protecting Personal Data, Processing, Saving and Terminating are prepared by İDO. As a part of legal and social responsibility İDO undertakes to comply with national personal data protection regulations. Institution is intending to inform customers, potential customers, working candidates, Company shareholders, Institution authority, visitors, employees, shareholders, authority of institutions which are cooperated with and third parties about processes of protecting and processing, deleting, terminating and anonymizing of personal data. In addition to legal liabilities, İDO collects personal data particularly for the loyalty program called HEPİDO in order to give better service. Collected data allows İDO to make informative announcements about advantageous transportation opportunities, personal special advantageous suggestions and future events. In addition, gathered data allows us to take most efficient feedback about our services and servitudes while being in information exchange with personal data holders. In according with PPD Law and legal regulations, İDO the data responsible, from procedures and principles regarding basic principles adopted for processing and protecting of personal data, administrative and technical precautions taken for protecting personal data and designating maximum period of time for the purpose that they are processed. In this Policy detailed explanations are given by İDO regarding which data is personal data, which personal data is kept, administrative and technical precautions for protecting personal data, processing, securing personal data, illuminating and informing personal data holders, transferring to third parties and protection of data. In this context, these are related to the personal data collected with the consent of İDO's customers, potential customers, employees, employee candidates, İDO shareholders, officials, our guests who get tickets via our İDO website, our İDO mobile application, İDO agencies and İDO tolls, institution employees, shareholders and authorities and third parties that have business partnership which are completely or partially automated or as part of any data recording system, processed by non-automatic means. Anonymized and unidentified data, such as data that does not contain personal data obtained for statistical evaluations or studies and the data on legal entities are not considered as personal data and are not subject to this Policy. This Policy applies to real person customers of İDO and its affiliated companies, as well as to affiliates under the control of İDO and other real persons who do not have a specific framework agreement. The İDO statements included in this Policy shall also include the subsidiaries of the Institution under its control. The policy was published by the Company on the website and released to the public. The provisions of the legislation shall be applied in case of contradiction with the legislation in force and Law No 6698, and the regulations that are in force in this Policy. The Company reserves the right to make changes in this Policy in parallel with the legal regulations. The current version of the policy is available on the İDO's website (www.ido.com.tr). Consent on a particular subject which is based on information and which is expressed by free will. Any information relating to an identifiable or identified real person. For example; name-surname, T.R ID Number, e-mail address, phone number, address, date of birth, credit card number and so on. Data on race, ethnicity, political thought, philosophical belief, religion, denomination or other beliefs, attire, association, foundation or union membership, health, sexual life, criminal conviction and security measures, and biometric and genetic data. Is changing personal data to lose it personal data quality and never to reverse this status back. All kinds of transactions made on data as obtaining, recording, storing, keeping, changing, rearranging, announcing, transferring, taking over, making it obtainable, classifying or preventing usage of personal data in non-automatic ways on condition that they are part of completely, partially automatic or any data recording system. Real persons who have used or are using the products and services offered by our Company, regardless of whether they have any contractual relationship with our Company or not. The real or legal person data supervisor who establishes and manages the system where data is kept systematically (data recording system) and determining the purpose and means of processing personal data. It is the Data Supervisors Registry maintained by the PPD Law Corporation Governance under the supervision of PPD Law Board and open to the public. İstanbul Deniz Otobüsleri San. ve Tic. A.Ş. The third real persons who are in contact with the parties to ensure the security of the commercial transaction between the parties defined above and İDO or to protect the rights of the parties involved and to obtain the benefit. These are data that are biometric and genetic such as race, ethnicity, political thought, philosophical belief, religion, sect or other beliefs, costumes and attire, association, foundation or union membership information, data on health and sexual life, criminal conviction and security measures that are specified as special qualified personal data specified in Article 6 of PPD Law. Personal data on evaluating and receiving any kind of requests and complaints that have been directed to the communication channels of İDO by real persons that are the customers of İDO or non-customers of İDO. Personal data processed through the methods that are used in accordance with the generally accepted legal, commercial and honesty rules in order to manage our commercial, technical and administrative risks. •	İDO increases its awareness of data processing institutions, such as business partners and suppliers to prevent unlawful access to data and to ensure the proper storage of data, from whom it transfers personal data to prevent unlawful processing of personal data. •	Obligations of İDO to comply with the obligations of personal data and the legal, administrative and technical measures it has developed is installed in accordance with the nature of the activities carried out by the institution for the data processing institutions. •	İDO takes necessary technical and administrative measures according to the technological opportunities and implementation cost in order to prevent personal data are being disposed, lost or changed for preventing unlawful purposes. •	In accordance with Article 12 of the PPD Law, İDO carries out or undertakes the necessary inspections within the scope of itself. These audit results are reported and the necessary activities are conducted to improve the measures that have been taken. •	In case of personal data processed in accordance with Article 12 of the Law on PPD are obtained by others by unlawful means, İDO carries out the system which provides information to the relevant personal data holder and PPD Board as soon as possible. During the use of the Institution's services and after the end of the relationship, the institution shall have the right to process the data of a data holder by complying with the principles set out in Article 6.3 of this Policy. Under no restrictions, İDO's personal data processing activity includes any actions performed for the data using automatic, semi-automatic or non-automated means. In other words, personal data processing refers to transferring, disseminating or presenting in different ways, grouping or merging, blocking, deleting or disposing data, collecting, recording, photographing, recording voice, taking video recording, organizing, storing, changing, reinstatement, retrieval or disclosure, data to be acquired by non-automated means, whether fully or partially automated or as part of any recording system, storage, preservation, replacement, reorganization, disclosure, transfer, export, import, acquisition, retrieval, classification or prevention of use. During the period in which the services are used, İDO shall have the right to process the data of a data holder in accordance with the following principles after the termination of the relationship. Pursuant to Article 5 of the Law on PPD, personal data may only be processed in accordance with the procedures and principles set forth in the Law on PPD and other relevant legislation. As İDO, personal data are processed in accordance with the procedures and principles specified in the PPD Law and other relevant legislation and under the PPD Law, it is clearly defined that the following principles should be observed in the processing of personal data. İDO carries out the process of processing personal data in accordance with the legal regulations and trustworthiness principle, mainly with PPD Law and other relevant legal regulations with the Constitution of the Republic of Turkey. While conducting personal data processing, İDO has set up systems and processes to ensure the accuracy and actuality of the personal data it processes. In this context, İDO takes the necessary measures to correct personal data holders' personal data and to verify their accuracy. •	Specific, clear and legitimate processing of personal data The IDO shall provide for the purpose of processing personal data clearly and conclusively with the purpose of processing the personal data, and operates within the scope of open and lawful purposes under the scope of lighting obligation set out in Article 10 of the PPD Law. İDO processes personal data in a timely manner and in accordance with the purpose of determining the service that it has defined before the commencement of processing. İDO does not carry out personal data processing activities, which are not related to the realization of the objective or are presumed to be needed in the future. The processing of personal data is limited to İDO's activities and legal obligations. •	Storage of Personal Data as Required for the Purpose foreseen in the Related Legislation or for the Purpose of Processing İDO stores personal data as limited by the time required for the purpose for which it was committed, in accordance with the PPD Law. In this regard, İDO keeps the personal data for a period of time required for the purpose for which it was committed and if it is not provided for a period of time, it is kept for a period of time necessary for the purpose for which they were processed. İDO does not store any personal data with the possibility of future use. İDO deletes, disposes or anonymizes personal data if the reasons for the expiration or processing of data disappear. İDO processes personal data only with the explicit consent of the person or in the cases provided for in the law. Except for explicit consent, personal data may also be processed in the presence of one of the other conditions listed below. The basis of personal data processing can be only one of the following conditions, and more than one of these conditions may be the basis of the same personal data processing activity. In the event that the processed data is personal data, the following conditions apply. In accordance with the regulation laid down in Article 5 of the PPD Law, İDO operates in the event that the person has explicit consent as a rule. However, in accordance with Article 2, paragraph 2 of the Law on PPD, the Legislator has enabled the processing of personal data in cases where there is no explicit consent. Accordingly; personal data can be processed by İDO in the presence of one and/or a few of the other conditions written in the clauses ''Obviously seen in the Law'' and ''Data Processing for the Legitimate Benefit of İDO with the Registration of Not Damaging the Fundamental Rights and Freedoms of the Related Person'' which are as follows. Although the existence of one of the following conditions is sufficient for personal data processing, more than one of these conditions may be the basis of the same personal data processing activity. In the event that the processed data is specially qualified personal data, the conditions to be applied are addressed separately in Section 7.1 of the Policy. One of the conditions of processing personal data is the explicit consent of the personal data holder. The personal data holder should disclose that he or she is sufficiently informed on a particular subject and has the consent to the processing of personal data in such a manner that it will not hesitate on the basis of this information. The personal data of the data holder may be processed by İDO without the explicit consent of the data holder in accordance with the law if it is expressly foreseen by law. For example, personal data is processed while keeping the workplace file of the employees within the framework of Labor Law and related legislation. In case of the obligation for the protection of the life or body integrity of the person or someone else who is unable to disclose his consent due to the actual impossibility or whose legal consent is not given to his consent, personal data of the data holder can be processed. If the personal data holder cannot reveal his consent or if his validity cannot be validated, the personal data of the data holder can be processed if it is necessary to process personal data in order to protect the life of the person or another person's integrity. For example, these personal data are processed in the event that the health information of our guest who has an accident on the IDO terminal or ships is given to the terminal authorities by the family. The requirement to process personal data of the parties of the Contract provided that it is directly related to the establishment or performance of an Agreement. If there is a requirement to process personal data of the parties of the Contract provided that it is directly related to the establishment or performance of an Agreement, the personal data can be processed by İDO. If there is an obligation of Data Processing for the fulfillment of the legal obligation of İDO, personal data of the data holder can be processed. For example, in accordance with the complaints made to the Public Prosecutor regarding the expenditures made on credit cards without the knowledge of the credit card holders, the presentation of the data in case of requesting personal data from İDO by the decision of the Prosecutor's Office. In the event that the data holder has personally clarified his personal data (he has publicly disclosed it in any way and in any way such as social media, etc. ), the relevant personal data shall be processed by İDO without explicit consent. For example, this data of the person who wrote down the phone number on the main page of the İDO social media account and who called for work can now be processed without the explicit consent of it but limited to this scope. If there is an obligation of Data Processing for the Establishment or Protection of a Rights, the personal data of the data holder can be processed. If there is an obligation to process data for the legitimate interest of İDO, without prejudice to the fundamental rights and freedoms of the relevant person, the personal data of the data holder can be processed. For example, personal data processing activities in the financial affairs department. Personal Data, defined as "Special Quality Personal Data" within the scope of Law on Protection of Personal Data due to the risk of causing victimization or discrimination of people when processed illegally have been separately stated in this Policy for this sensitivity. It is prohibited to process Special Quality Personal Data, defined in Law on Protection of Personal Data Article 6 Paragraph 1, without the consent of the data holder as specified in Law on Protection of Personal Data, Article 6, Paragraph 2. Law on Protection of Personal Data, Article 6, Paragraph 3 regulates the exceptions of this rule. Special quality personal data are processed by İDO in compliance with the aforementioned article of the law, provided that adequate measures to be determined by Board of Law on Protection of Personal Data have been taken. The Personal Data Protection Act stipulates that personal data are separately specified in this Policy because of the risk that they may result in discrimination or victimization of persons when they are unlawfully committed. The processing of Special Personal Data is clearly specified in Article 7.1 of the Policy. For the employees involved in the processing of special personal data, necessary measures are taken for providing regular trainings on law and related regulations as well as special personal data security issues, making confidentiality agreements, identifying users with access to data, clarifying the scope and duration of their authorization, periodically performing authorization checks, immediate abolition of authority in the field and in this context, the inventory assigned to him by the data holder shall be returned. If the media, where special personal data are processed, stored and/or accessed, is electronic media, necessary measures are taken for keeping the data using cryptographic methods, keeping the cryptographic keys in safe and different environments, safe logging of transaction records of all transactions performed on the data, continuous monitoring of security updates for the environments where the data is located, performing necessary security tests regularly, recording the test results, user authorization of this software if the data is accessed through a software, performing regular security tests of this software, recording of test results, providing at least two-level authentication system if remote access to data is required. If the media, where special personal data are processed, stored and/or accessed, is physical media, necessary measures are taken to ensure that adequate security measures are taken (according to the nature of the environment where special qualified personal data is located) and that the physical security of these environments is ensured by preventing the unauthorized entrances. It is necessary to transfer/share data related to the data holder and/or the third parties pointed out by the data holder in accordance with the purpose of serving the data holder as required by the İDO. Personal data can be transferred to the business partners, suppliers, Institution authorities, shareholders, subsidiaries, subsidiaries, public institutions and private individuals authorized by law, within the framework of the personal data processing requirements and purposes set forth in Articles 8 and 9 of the PPD Law for supplying the work done by the business units to benefit from the products and services offered by İDO, the offer of products and services offered by the institution according to the tastes, usage habits and needs of the customers, the legal and commercial security of the persons who have business relations with İDO and İDO's administrative operations for communication, physical security and control of the locations of the institution, processes of evaluation of the partner/customer/supplier (authorized or employee), reputation research processes, legal compliance process, audit, financial affairs etc. ), İDO's commercial and business implementation of human resources policies of the organization with the determination and implementation of strategies. İDO can transfer the personal data of the personal data holder and the special personal data to the third parties (third party companies, group companies, real third parties) by taking the necessary security measures in accordance with the law for personal data processing purposes. Accordingly, the Institution complies with the regulations stipulated in Article 8 of the Law on PPD. İDO applies the exceptions to the transfer procedure specified in this Policy article, as set out in Article 8, paragraph 2 of the Law on PPD. The provisions of other laws relating to the transfer of personal data are reserved. •	(authorized or employees), reputation research processes, legal compliance process, audit, financial affairs etc.) and for establishment and implementation of İDO's commercial and business strategies and ensuring the implementation of the Company's human resources policies within the framework of the personal data processing requirements and purposes set forth in Articles 8 and 9 of PPD Law. İDO can take the necessary precautions and take the necessary security measures to take the necessary security measures and transfer the private data of the personal data holder to the third parties taking into account the conditions set forth in Section 7 of this Policy in accordance with the legitimate and lawful purposes. İDO can transfer the personal data of the data holder and the special personal data to third parties by taking the necessary security measures in accordance with the law. The personal data processed by İDO can be transferred pursuant to Article 9 of the Law on PPD and provided that adequate measures are taken with the paragraph 2 of Article 5 of the Law on PPD in the event that one of the conditions laid down in Article 6, paragraph 3 of the Law on PPD and if the foreign country where the personal data will be transferred has been declared as one of the countries with sufficient protection by the PPD Board or if there is not enough protection provided that those responsible for the data in the relevant foreign country and Turkey commits adequate protection by written consent and if there is an approval of PPD Board. In accordance with the legitimate and lawful personal data processing purposes, İDO may transfer the special personal data of the data holder to the countries that have sufficient protection or committed to adequate protection by the data responsible in the foreign country, taking into account the conditions set out in Section 7 of this Policy by taking the necessary security measures and taking adequate measures prescribed by the Board of PPD. If the special qualified personal data should be transferred via e-mail or if it must be encrypted using a corporate e-mail address or a Registered Electronic Mail (REM) account or if they should be transferred via media such as portable memory, CD, DVD or if they should be transferred via paper data or if the data transmission should be performed via establishing VPN among servers or via SFTP, necessary measures and precautions are taken to take necessary measures against the risks such as theft, loss or unauthorized viewing of the documents and to send the documents in the form of ''confidential documents''. The scope of the persons mentioned above and the purposes of the data transfer are stated below and transactions carried out by İDO are in compliance with the provisions of Section 10 of the Policy. İDO defines the parties to which İDO establishes business partnerships for the purposes of sales, promotion and marketing of İDO services, after-sales support and execution of joint customer loyalty programs. While carrying out the commercial activities of İDO, it defines the parties providing services to our Company based on the contract in accordance with the orders and instructions of our Company. As being limited in order to ensure that İDO provides outsourced services from the supplier and that İDO provides the services required to carry out the commercial activities of İDO. Pursuant to Article 10 of the Law on PPD; İDO is obliged to clarify personal data holders during the acquisition of personal data. In this context, İDO announces rights of data holder in accordant PPD Law's 11th article with the method and legal reasons that personal data shall be processed by İstanbul Deniz Otobüsleri San. ve Tic. A.Ş. during collecting of personal data, in which purpose that these data shall be processed, to whom and in which purpose these processed data shall be transferred and takes direct consent. 9. To request compensation for the damages in case the person incurs damages due to unlawful processing of personal data. In the case of the existence of the conditions specified in the 1st paragraph of Article 28 of the Law on PPD, the provisions of the Law on PPD are not applied and and in this context, it is not possible for personal data holders to assert their rights, which are listed in the Law on PPD, regarding personal data processed by İDO. In the cases specified in the Article 28 (2) of the Law on PPD, personal data holders cannot claim other rights mentioned in the Law on PPD except for the right to demand the remedy of the damages. Personal data holders are required to fill in the application form on the İDO's website www.ido.com.tr and submit their requests for the use of the rights granted to them by law to “Kennedy Cad. Yenikapı Hızlı Feribot İskelesi 34480 Fatih / İstanbul” address with wet signed or secure electronic signature. It is not possible for third parties to make requests on behalf of the personal data holders, and a third party must be authorized by a special power of attorney for the third party to apply for the request of the third party. Pursuant to Article 13 of the Law on PPD; the requests contained in the application submitted by the personal data holder in accordance with the above procedure shall be concluded by İDO in the shortest time according to the nature of the request and within 30 days at the latest. In the event that the transaction requires an additional cost, the İDO may charge a fee in the tariff determined by the PPD Board from the applicant. If the application is caused by the fault of İDO, the fee will be returned to the relevant person. İDO may request information from the relevant person to determine whether the applicant is a personal data holder and to clarify the requests contained in the application. It is not possible to mention the responsibility of İDO in the event that the claims that are not communicated in accordance with the procedure mentioned in Section 9.4 of the Policy and/or that are not communicated with İDO. (1) The request of the personal data holder may prevent the rights and freedoms of others. (2) Requests for disproportionate effort have been made. (3) The requested information is publicly available. The personal data holder may lodge a complaint with the board as specified in Article 14 of the Law on PPD. The personal data holder cannot lodge a complaint with the PPD Board without using the right to apply under Article 13 of the Law on PPD and Section 9.4 of this Policy. The İDO takes all necessary technical and administrative measures to ensure the security level and carries out the necessary audits or contracts within the framework of the agreements made with third parties in accordance with Article 12 of the PPD Law. Personal data processed by the İDO in accordance with the law are subject to data security. İDO takes all necessary technical and organizational measures to ensure the confidentiality and security of your personal data collected through our personalized personal data and our web sites and/or other applications. It is forbidden for any employee of İDO to access this data unauthorized, to process this data or to use it for private or commercial purposes, to share this data with unauthorized persons or to make this data available to any other means. Employees of İDO may only have access to personal data in accordance with the type and scope of their respective duties. Therefore, roles and responsibilities are elaborated and separated. Any employee who is not authorized under the legitimate duty of İDO to process this data means unauthorized action. Managers should inform employees about the obligation to protect data confidentiality at the beginning of the employment relationship. This obligation will continue after the termination of employment. Before accessing personal data, verification of the credentials of the data holder whose personal data is stored, through the website or the application. This provision shall be valid whether the data are processed electronically or on paper. The following technical and administrative measures are defined and implemented to protect personal data until new data processing methods, especially new information technology systems, emerge. These measures are designed taking into account the most advanced technology available, the risks of data processing and the need to protect data. Within İDO; Personal data processing activities and keeping them in secure environment are conducted via technical systems and technical solution applications are applied. Concordant technical precautions are taken and they are periodically updated and renewed. The technical precautions are periodically reported to the related persons by the internal audit mechanism and the risk factors are re-evaluated and the necessary technological solutions are produced. Knowledgeable staff on technical issues are employed on technical issues. Software and hardware including virus protection systems and firewalls are used. Secure Sockets Layer (SSL) encryption is used on all web pages where personal data is collected through online services such as İDO site and İDO mobile application. To take advantage of these services, an SSL-supported browser such as Safari, Firefox, Chrome or Internet Explorer is required. In this way, the confidentiality of personal data transmitted over the Internet can be protected. The İDO complies with the PCI DSS (Payment Card Industry Data Security Standard) regulations designed to ensure data security in card payment systems, and provides secure data transmission and operation in card payment systems. The credit card number is encrypted by İDO's online credit card application and transmitted to the bank and never shared with third parties. Credit card information is not kept by İDO. To ensure that personal data is securely stored, backup programs are used in accordance with the law. In addition, the data classification system used within the organization is integrated with the data leakage prevention (DLP) system. Thus, all electronic documents containing personal data within the İDO have to be classified and taken out of the institution is kept under control by the DLP system. Employees are informed and trained about the protection of personal data and the lawful processing of personal data in accordance with the law, which cannot be disclosed to anyone other than the legislation and cannot be used outside the process. The agreements and documents between İDO and its employees are accompanied by the records and commitments that impose an obligation not to process, disclose and not use personal data, except for the exemptions issued by the İDO directives and the law. Necessary administrative measures are taken to ensure that the compliance of the employees with the non-disclosure, non-disclosure and non-use obligations and to ensure the continuity of the application. In cases where technical service is received from third parties for the storage of personal data and personal data of the İDO, provisions regarding the prevention of unlawful processing of personal data, prevention of unlawful access to the data and taking necessary measures to ensure that the data are kept in compliance with the law and ensuring that these measures are observed in their own organizations are added to the contracts with these persons. İDO provides training and seminars related to maintaining the data storage and to prevent unlawful access to data and to prevent unlawful processing of personal data for business partners. In accordance with Article 12 of the PPD Law, İDO carries out the necessary audits within its own and business partners or makes the contracts within the framework of the agreements made with third parties. These audit results are reported to the relevant department within the scope of the company's internal operation and the necessary activities are carried out to improve all measures that have been taken. The IDO is obliged to make the said provisions in accordance with Article 5 paragraph 5 of the Law on PPD and the necessary system is established in order to provide the necessary determination and notification if personal data obtained in accordance with the Law on PPD and the relevant legislation are obtained by others by unlawful means. Following the notification made to the PPD Board, the PPD Board may declare this situation as set out in Article 12, paragraph 5, of the Law on PPD. All transactions relating to the deletion, destruction and anonymization of personal data shall be recorded and such records shall be kept for at least three years, with the exception of other legal obligations. İDO complies with the following principles when storing and disposing of personal data. a) Compliance with the rules of law and integrity. b) Being accurate and up-to-date if necessary. c) Processing for specific, clear and legitimate purposes. ç) Being connected, limited and measured according to the processing purpose. d) To be kept for the period stipulated in the relevant legislation or for the purpose for which they were processed. •	Where the processing of personal data only occurs on the basis of the express consent, the relevant person shall withdraw his consent. •	The elimination of conditions requiring the processing of personal data in Articles 5 and 6 of the Personal Data Protection Act. The deletion or disposal of personal data is the process of making personal data inaccessible and unavailable to users in any way. İDO erases or disposes of personal data using the techniques listed below. •	The İDO shall take all necessary technical and administrative measures to ensure that the deleted personal data is not accessible and accessible to the concerned users. Personal data can also be processed in non-automated ways, as part of any data logging system. When such data is deleted/disposed of a system of physical destruction of personal data which cannot be used after being implemented. When deleting/disposing of data that are processed in fully or partially automated ways and stored in digital media, methods for deleting the data from the respective software are used so that they cannot be recovered anymore. In some case İDO might come into terms with an expert to delete personal data on behalf of itself. In this case, personal data shall be deleted/erased safely never to recover anymore by an expert. Anonymization of personal data is that personal data can never be associated with a particular or identifiable real person, even if personal data is paired with other data. İDO can anonymize personal data if the conditions for processing personal data processed in accordance with the law are eliminated. Thus, anonymized personal data can be processed for purposes such as research, planning and statistics in accordance with Article 28 of the Law on PPD. Such processing shall be outside the scope of the Law on PPD and the express consent of the personal data holder shall not be sought. As the personal data processed by anonymity will be outside the scope of the Law on PPD, the rights set out in Section 9 of this Policy shall not apply to these data. İDO uses the following techniques to anonymize personal data. It is a method of anonymizing personal data by removing data from the data set by using data masking. For example, removing the name, surname, TR ID number, and so on, enabling the identification of the personal data holder. With data blending method, the values are mixed in the personal data set and it is ensured that the link between the values and the people is removed. İDO deletes, erases or anonymizes personal data in the first periodic destruction following the date of the obligation to delete, dispose or anonymize personal data. The period of periodic destruction is six months. Regarding personal data, the retention periods have been determined in accordance with the PPD Law and business processes. The Board of PPD may shorten the time limits set forth in this article, in the event of irregularities or irregular damages. The real person who owns the data requests the deletion or disposal of his personal data by applying to İDO, pursuant to Article 13 of the Law on PPD. a) If all the processing conditions for personal data have been eliminated, İDO deletes, disposes or anonymizes personal data subject to the request. İDO shall finalize the request of the real person of the data within 30 days and inform the real person of the data. b) If all personal data processing conditions have been eliminated and the personal data subject to the request has been transferred to third parties, İDO shall inform the third party of this fact and shall ensure that necessary actions are taken by the third party. c) If the conditions for processing the personal data have not been completely eliminated, this request may be rejected by the İDO in accordance with Article 3, Paragraph 3 of the Law on PPD and the rejection shall be notified to the person concerned in writing or electronically within thirty days at the latest. •	the period of periodic disposal may not be longer than 180 days. •	If all the conditions for processing personal data have been eliminated, İDO may delete, dispose or anonymize personal data subject to the request. Deletion or disposal requests of the relevant persons shall be finalized by İDO at the latest within thirty days. •	If the conditions for processing the personal data have not been completely eliminated, this request may be rejected by İDO and the rejection shall be notified to the person in writing or electronically within thirty days at the latest. A customer who asks for their personal data to be deleted from İDO systems may request the deletion of his/her personal data by contacting him personally or through the Corporate Web Page. The request received from all channels is stored in the paging system and the customer is called back by the call center for verification. After clarifying the data of the customer of the İDO system, the deletion process in the relevant systems will be executed and the customer data will be deleted. In accordance with the procedures and principles set forth in the PPD Law and other laws, İDO records and stores the personal data that is completely or partially automated or processed in non-automatic ways as part of any data recording system in the İDO data warehouse. Personal data processing is carried out by monitoring with security camera at terminals, toll booths and facilities for purposes such as increasing the quality of service provided by İDO, ensuring its reliability, ensuring the security of the company, its guests and other persons and protecting the interests of the guests. The monitoring activity carried out by our company is carried out in accordance with the Law on Private Security Services and related legislation. It is not subject to monitoring in areas where the privacy of the person may result in an intervention that exceeds the safety objectives (eg toilets). In accordance with article 10 of the PPD Law, the personal data holder is clarified by İDO both in terms of the publication of the Privacy and Data Security Policy on the website and the notification of the monitoring of the entrances to the areas where the monitoring is made and the personal data that have been obtained are protected by the administrative and technical measures referred to in this Policy. 12.2. Monitoring Guest Entry/Exit in Terminal, Head Office Building and etc. İDO carries out personal data processing by obtaining the identity of the visitors and logging into the Visitor Program for the purpose of ensuring security and following the visitors' entrance and exits at İDO buildings and terminals for the purposes stated in this Policy. In order to provide security by the Institution, personal data processing activities are carried out in the premises of premises and facilities for monitoring the visitors' entrance and exits through the surveillance camera. Within the scope of monitoring activities with the security camera, the Institution has the purpose of increasing the quality of the service provided, ensuring its reliability, ensuring the security of the Institution, customers and other persons and protecting the interests of the customers regarding the services they receive. Necessary technical and administrative measures are taken by the Institution in accordance with Article 12 of the PPD Law to ensure the security of the personal data obtained by monitoring the camera. Log records related to internet access are recorded in accordance with the provisions of Law No. 5651 and the legislation regulated in accordance with this Law and these records are processed only for the request of the authorized public institutions and organizations or for the fulfillment of the related legal obligations in the audit processes to be performed within the Institution. İDO, on the websites it owns, is able to record internet activity within the site by technical means (eg cookies) in order to ensure that the visitors of these sites perform their visits on the sites in accordance with the purpose of their visit, to show them customized content and to perform online advertising activities. Detailed information on the protection and processing of personal data related to these activities are available in texts of ''İstanbul Deniz Otobüsleri San. ve Tic. A.Ş Privacy and Data Security Policy'' of the related websites. •	To carry out other duties assigned by senior management to the protection of personal data. Ticket change and refund conditions were changed related to the new e-ticket system formed on 1 March 2016. • Tickets that you have purchased online, via our mobile application or by calling our Call Center at 0850 222 44 36, whether it’s printed or online, can be changed or refunded on any sales channels excluding mobile application. • Tickets that you have purchased at ticket offices or agencies in cash or by a credit card can only be changed or refunded on the relative ticket office or agency. IDO tickets purchased from Metro agencies can be cancelled and refunded only at the same metro agency. • The deduction (forfeit) to be applied on ticket changes or refunds will be calculated based on the total amount including VAT after deducting the service fee. • Ticket change and refund conditions vary depending on the ticket class and service fee depending on the sales channel cannot be refunded. (The remaining amount from the deducted service fee can be refunded). • BIZ (Business) and VIP (VIP Room) tickets are upper lounge tickets of fast ferries only on Yenikapı-Bandırma and Yenikapı-Bursa line. • Passengers, if they wish, can change or return their tickets. Along with the new e-ticket system, any change or refund can be easily performed for any types of tickets, whether online or printed. • Tickets purchased online, via mobile application or Call Center at 0850 222 44 36 are automatically returned to the credit cards 72 hours after the cancelled trip. Passengers also can change their tickets, within the first 72 hours, on the website or by calling our Call Center with other trip tickets on the same direction within the first 7 days. • For the tickets purchased in cash or by a credit card at ticket offices or agencies, you need to apply any ticket office or agency within 1 month to return, and within 7 days to change. For return-trip tickets, cancellation of the departure trip does not necessarily mean the arrival trip is cancelled. Passengers can refund their tickets without any deduction upon their request. You can purchase tickets from the terminals written below. You can easily purchase your ticket via our mobile application for both IOS and Android mobile devices. Please click here to download hazardous substance manual in Maltepe. Please click here to download hazardous substance manual in Sirkeci. Please click here to download hazardous substance manual in Harem. *** Discounts only apply to foot passengers. • You can purchase your ticket at our IDO terminals and our agents. What is the reason for getting a service fee based on the ticket sales channel? Our service fee included in the ticket prices has been separated from our ticket prices in our new sales system in accordance with our transparency principle. To ensure the persistence of the technology and the service that we offer, the service fee is added to the ticket prices for the services provided while purchasing tickets. The service fee charged per seat varies depending on the features of the sales channels. Why is it required to have the name, surname and date of birth information of all passengers while purchasing an inter-city line ticket? It is required to have the name, surname, gender, nationality, and date of birth of our guests for inter-city ticket purchases, under the 'Regulation on Passenger Ship Safety and Registration of Passengers on Board'' of the under secretariat of Maritime Affairs. Could another passenger use my inter-city line ticket in place of me? A ticket issued to your name cannot be used by another passenger. No booking can be made through our ticket sales channels. Up to how many tickets can I buy? You can get tickets for up to 9 people at a time. Can I buy a collective ticket? Tickets for 10 people and more are accepted as group tickets. You can submit group ticket requests to our mail address: grupsatis@ido.com.tr you can forward it to our address. Can I add additional service to my ticket? You can also add our "Travel Health Insurance" service that we offer as an additional service while purchasing your ticket. How long before the departure time can I buy a ticket from the website? You can purchase your tickets at least 30 minutes before the departure time. Can I get tickets of round trips by choosing different locations? You can check your departure and return route different from one another and process your ticket transactions. For instance, you can go to Bandırma and go back from Bursa or you can go as an on-foot passenger and return with your car. Can I change my ticket to an upper class? You can change your economy class tickets to business class by paying the difference thanks to our "Class Change" feature on www.ido.com.tr, our ticket offices located at the terminals or our call centre on 0850 222 44 36 that you can reach 24/7 after you participate in the trip. Can I make payment on the call centre without giving my card information to account representative? During the call with our call centre on 0850 222 44 36, which you can reach 24/7, you can connect to our voice response system with the help of our customer representative and you can process your payment by entering your card information. Can I buy tickets with foreign currency? You can only make TRY currency payments. Can I pay the ticket by bank transfer? We cannot process the payment by bank transfer. Yes. You can save your credit card information. Our Hepido member guests can register their credit card information by checking the "I want to save my credit card information" option and by entering the password sent to their mobile phone through a text message. Thus, you can purchase your ticket quickly without having to enter your personal information and card details once again. Will my credit card information securely be saved? Payment solution with just a click offered byPayU (infrastructure of payment solutions) allows you to save your card information during the payment and process your transactions without having to enter your card information in your next transaction. During payment stage, you can view your registered cards and use any of your cards you wish. Your card information will be protected by PayU (payment solutions sub-structure) without any security risks. The saved card information is transformed into a "smart key" (token), which is transmitted to the bank during the payment, ensuring that your transaction is processed safely. PayU, the affiliate of Naspers, offers payment services to millions of customers in 16 countries. PayU holds the licences of PCI Data Security Standard, Level 1 certification and the payment institution license granted by BDDK. For more information, please visit www.payu.com.tr. I forgot to take my ticket that I bought online, how can I find out my ticket information? • After your ticket purchases, you will receive your ticket information via e-mail and SMS. • Our guests who are Hepido members can view all past and next tickets within our loyalty program. • Our guests using the mobile application can access their ticket information in detail thanks to the application. • Our guests can access their ticket information by giving their name, surname and trip information to our ticket offices located at IDO terminals, our call centre on 0850 222 44 36 which can be reached for 24/7 and our agencies. 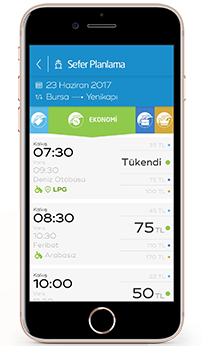 • Within the scope of our e-Ticket application, our guests can view their ticket information on ebilet.ido.com.tr by entering the PNR information and their surnames. Can I use my e-ticket as an invoice? Our guests who bought the tickets from our ticket offices, agencies and call centre channels should also indicate to our staff that they wish to use their tickets as invoices. And the guests who bought their tickets on www.ido.com.tr and IDO Mobile application should check the "I want an e-ticket" option. Otherwise, the tickets will not be accepted as an invoice. How can I view my e-ticket? 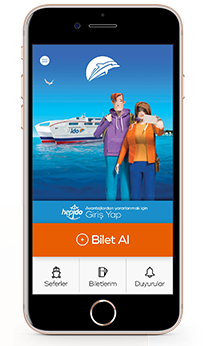 You can view your ticket on ebilet.ido.com.tr using your PNR information and surname at any time. No changes on passenger information can be made once the ticket has been created. What should I do when the timetable is changed? In case of a timetable change in the ticket you have purchased, you can change or return your ticket without paying any charge difference. What are the conditions for returning and changing the ticket that I have purchased? How can I make the refund and change transactions for the ticket that I purchased? For tickets purchased in cash or by a credit card at our IDO terminals and agents, it is sufficient to apply to our offices or your nearest agent. Besides, for the tickets purchased on www.ido.com.tr, our IDO Mobile application or our call centre, you can process your change/return transactions on www.ido.com.tr or through our call centre in the scope of the applicable rules of the ticket class. I could not get on board because I changed the vessel since my car runs on LPG. What can I do? You can change or return your tickets free of charge on condition to be the same line and the same direction through our call centre on 0850 222 44 36 where you can reach 24/7 or on http://www.ido.com.tr . I will not be able to show up on the day of the trip due to an illness or death situation. How could you help me about my ticket? When the medical report or the death notice of the person whose name is issued on the ticket is presented and if deemed appropriate, the ticket can be returned. I bought a round-trip ticket, can I cancel one-way ticket? You can return your tickets through all of our sales channels, except our IDO Mobile application, within the framework of the relevant ticket class and the related refund rules of the payment method. What should I do to include my baby / child in the ticket that I have already bought? You can add your child (0-5 years) free of charge through all of our sales channels except http://www.ido.com.tr and IDO Mobile application. The trip was cancelled due to the poor weather conditions, I would like to change my ticket. What should I do? Our guests who wish to change their tickets can complete their ticket change transactions by calling our call center within the first 24 hours or on our website, www.ido.com.tr free of charge, for the trips within the first 7 days and on the same direction. For the tickets purchased in cash or by a credit card through the ticket offices located at IDO terminals and agencies, it is required to apply within 1 month to change them and within 7 days to return them, to any of our ticket offices or agencies. The Hepido Loyalty Program is the address of a fast, comfortable and safe travel and a world of digital solutions and special advantages that IDO offers to its esteemed guests. Hepido offers you special campaigns and surprise discounts on contracted stores and a chance to save idoPara when you have inter-city line tickets. iDoPara is the award money that you earn from your trips with IDO. How can I purchase my award ticket with my idoPara? You can purchase tickets on the IDO Mobile application and www.ido.com.tr by signing in as a Hepido member if you have enough idoPara. The following rules will be applied for your award ticket purchases. • Award tickets cannot be cancelled, changed or returned as idoPara. • If we are the ones cancelling the trip, then idoPara will be returned to the account of the member. • HEPIDO members can only get award tickets from cabin-based classes (Economy (X) and Business (l)). 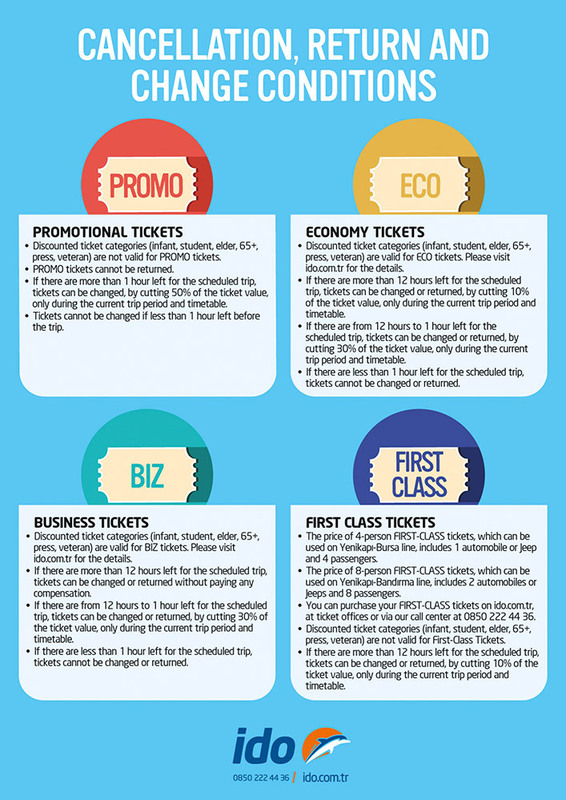 • HEPIDO members cannot earn miles from promotional class tickets. • Each guest can only earn idoPara from his / her own ticket, and no idoPara can be earned through tickets purchased for someone else. How can I change and refund the tickets that I purchased with my idoPara? Tickets purchased with idoPara cannot be changed or refunded except for trip cancellations. Do I have to be a member of HEPIDO to buy tickets from IDO's website? You can purchase your tickets on www.ido.com.tr without being a member. Besides, you can buy tickets more quickly and easily as a Hepido member and you can benefit from special advantageous campaigns. As per the law numbered 4207, smoking of any kind, including electronic cigarettes, is strictly prohibited on board including the open areas. If possible, you can prefer your seat by the window. Is there any internet access on board? You can have internet access on our vessels operating on Yenikapı - Bursa and Yenikapı-Bandırma lines. For more detailed information about our Wi-fi service, click here. Is there any catering service provided on board? Catering service is only provided for our guests traveling in our First-Class lounges. Are there places where I can purchase food and drink on board? Click here to see our food and drink areas on our vessels and at our terminals. Are there private passenger lounges on board? We have private rooms of 4 people on Yenikapı - Bursa line and First-Class rooms of 8 people on Yenikapı - Bandırma line. Can I visit the captain's bridge? Due to security reasons, it is not allowed for our guests to enter the captain's bridge. Do you have lifts on your ferries? Apart from the Pendik – Yalova line the vessels operated on the other three lines (Yenikapı – Yalova, Yenikapı – Bursa, Yenikapı – Bandırma lines) have lifts that elevate to the passenger lounges. Recep Tayyip Erdoğan and Fatih Sultan Mehmet operating on the Pendik-Yalova fast ferry line do not have lifts elevating to the passenger lounges. What is the difference between a fast ferry and a sea bus? While passengers and vehicles are carried with our fast ferries, only passengers are carried with sea buses. Can I have my bike with me on sea buses and fast ferries? Should I pay? Yes, you can. Bikes are carried free of charge on inner and inter-city line sea buses, which have a capacity of 3 per trip. On our fast ferry and conventional ferry lines, 10 bikes could be carried free of charge. Do you have infirmary on your ferries? Our captains and ship crew working on our ferries have first-aid knowledge and are qualified for intervention when necessary. Besides, there are first aid supplies on captain's bridges. In serious cases, we also contact the land staff for emergency assistance. Travel insurance refers to insurance products and options that protect against individual accident and treatment coverage as well as travel troubles. Is it possible to cancel or return your travel health insurance? Cancellation of the policy will be possible only if there is a valid cancellation reason. For detailed information, please click here. You can have your pets weighing up to 8 kg with you on the journey. Pets are not included in the free baggage allowance and would be charged. Can I park my car at the terminal? The parking lots next to our fast ferry and sea bus terminals are not operated by our company. Click to see the list of terminals with parking lots nearby. Do you have special services for disabled people? Are there ATMs at terminals? What if I have a wheelchair request? It would be sufficient to contact with our terminal staff to transmit your request. How could physically disabled and elderly passengers get on board? There are golf carts between the passenger lounge and the ship at the Yenikapı, Bursa and Yalova fast ferryboats, which enables our elderly and disabled guests to board the ship. There are also electric wheelchairs at our terminals if needed. From which terminals can I buy an inter-city ticket? You can purchase the inter-city tickets or make all related transactions from the ticket offices located at our Kadıköy, Bostancı and Pendik terminals on the Anatolian side of Istanbul and; Yenikapı, Bakırköy ve Beşiktaş terminals on the European side of Istanbul. Can I pay by credit card on Eskihisar - Topçular line? No credit card payment service is provided for Eskihisar - Topçular line. You can pass by paying in cash. Our on-foot guests can use their discounted Istanbul cards and our guests travelling with their cars can pay in cash or use HGS or Vakıfbank KGS cards (Electronic toll collection cards). Is the driver included in the price of the vehicle ticket? The driver is included in the price of the vehicle. How can I get the most affordable tickets? You can take our most advantageous price opportunities with early purchases or as being a Hepido member. What does the weekend timetable refer? On our fast ferries and sea buses, the weekend timetable is applied for Saturday and Sunday. If there is no special timetable for Eids, only the weekend and holiday timetables would be applied. 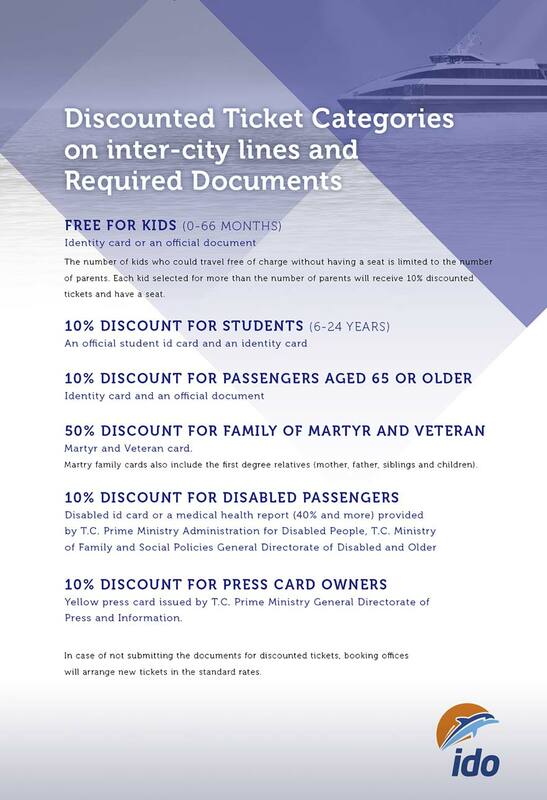 Can you use your Istanbul card on fast ferry and sea bus inter-city lines? 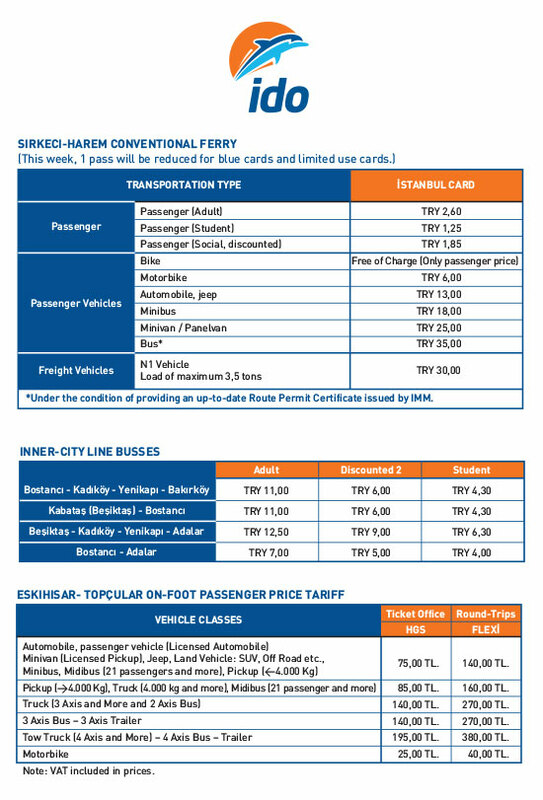 Istanbul Card only applies to inner-city sea buses and conventional ferry lines (on-foot passengers). You need to buy your ticket in advance since the inter-city lines are accepted as ticketed lines. The number of children (0-5 to 5 years) who are free of charge on condition that they travel without a seat is limited to the number of parents participating in the trip. When the number of children in the trip (0-5 - 5 years) exceeds the number of parents, a 15% discount ticket will be arranged by the system for each child and a seat could be given for each. How much should I pay for my excess baggage? What is the age restrictions for babies? Infants between 0-5 and 5 years old are classified as infant passengers on our vessels. I have realized that I’ve lost my suitcase after I got out, what should I do? With regard to the items you forget at our terminals and vessels, you can contact us by dialling our call centre that you can reach 24/7, on 0850 222 44 36 and pressing 5. I have found a lost item, what should I do? You can contact the ship's lounge manager or a terminal officer to direct you to the "Lost Property" unit if you have found a lost property. Where and how can I request additional trips? On special occasions such as official holidays and eids, we apply a special timetable and arrange additional trips depending on the requests of our esteemed guests and the situation of the boats in our fleet. You can follow our planned additional trips on our website www.ido.com.tr and IDO Corporate Facebook and Twitter accounts. You may contact us at info@ido.com.tr for your extra trip requests. The request and suggestions of yours, our esteemed guests, are very important to us. Reviewing your requests and we will certainly get back to you through your contact information. How can I learn about the opportunities and campaigns? You can be instantly informed of discounts and opportunities by filling the form of "Inform about the campaigns" on our homepage on www.ido.com.tr. How can I learn about the trips cancelled due to weather conditions and other compulsory reasons? Up-to-date information on cancelled trips can be accessed from our communication channels below. What is the number of IDO Call Centre? You can get service 24/7 from our Call Centre on 0850 222 44 36.